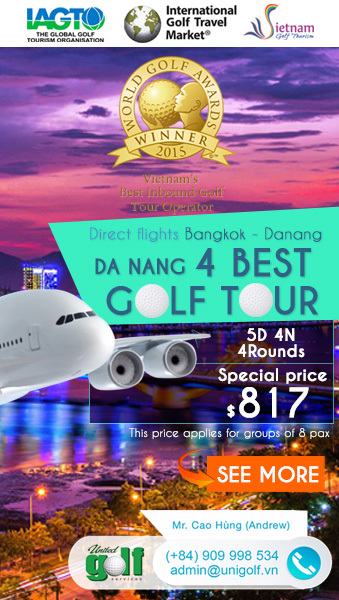 A golfing journey with three fantastic destinations, first explore Sai Gon – the biggest city in Vietnam then go to the oceanic city of Nha Trang and up to the mountain town of Da Lat. Ho Chi Minh City (HCMC), formerly named and still also referred to as Saigon is Vietnam at its most dizzying: a high-octane city of commerce and culture that has driven the whole country forward with its pulsating energy. There are several championship golf courses in Saigon such as Long Thanh, Song Be, Vietnam Golf & Country Club and Twin Doves… With several excellent golf clubs available and amazing historical & cultural sights Saigon is a indispensable stop for any Vietnam golf holiday. Dalat where is a famous mountain resort known for romantic landscapes, fresh cool air, and beautiful scenery located on the Lang Biang highlands – 300km from HCMC. Da Lat was originally built by French as an escape place from the heat and humidity of Sai Gon due to its temperate weather all year long. Dalat looks like a cross between Vietnam and the French Alps, the French influence of Dalat is evident all over this hotel, built in the classic French Colonial style. Dalat is the birthplace of golf in Vietnam. 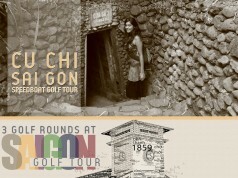 In 1922 the plan for Vietnam’s first golf course, the Dalat Palace Golf Club, was conceived. However, it was not until Emperor Bao Dai – Vietnam’s last Emperor, developed his own golf interest that Vietnam’s first golf course was actually built and opened for play in the 1930’s. In 1994, a multi-million dollar restoration project was completed and since that time Dalat Palace course has been recognized as one of the leading courses in the whole of Asia. Nha Trang where is located on the sweeping Nha Trang Bay (one of the world’s 30 most beautiful bays in the world) is considered Vietnam’s most famous seaside resort-town. Nha Trang Bay covers an area of 405 km2 including 19 large and small islands. When looking downwards from space, the bay looks like the aquamarine stone sparkling in the sunshine, bounded by miles of smoothly golden sands. Nha Trang attracts foreign tourists for not only its stunningly pristine beaches but also the urban atmosphere of a young tourist city. 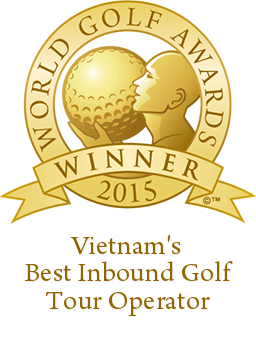 The two international standard Nha Trang golf courses rank among Vietnam’s best golf courses. Vinpearl Golf is a pioneer in the development and management of the finest golf courses in Vietnam’s most beautiful destinations. Diamond Bay Golf & Resort, completed in 2013, is one of Vietnam’s most strategic layouts and will challenge even the best professional golfers. City, beach, and mountain golf all combined in one package which is sure to be a holiday with a memorable experience for golfers. 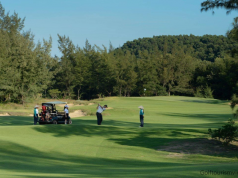 Make yourself a golf holiday throughout Vietnam’s top beautiful tourist destinations in Vietnam with 5 golf rounds at 5 high class golf courses. Play at the best courses in Saigon (Ho Chi Minh City), visit the coastal region of Nha Trang, and finish in the temperate highlands of Dalat. Arrival at Saigon’s Tan Son Nhat International Airport and transfer to hotel. Check-in then rest. Breakfast at hotel then play 1 golf round at Vietnam Golf & Country Club (home of the Vietnam Masters Asian Tour events) . In the afternoon & evening, visit the City Center with tourist attractions: Reunification Palace, Central Post Office, Notre Dame Cathedral, etc. Breakfast at hotel then play 1 golf round at Twin Doves Golf Club. 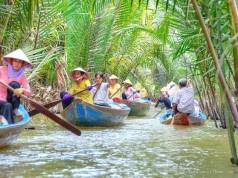 After finishing the golf round, you will back to HCM to visit War Remnants Museum and shopping at Ben Thanh Market. Transfer to Saigon Airport, domestic flight to Nha Trang. Arrival and transfer to hotel. Go to Nha Trang to visit Nha Trang Cathedral, Po Nagar Cham Tower. Golf at Diamond Bay Golf & Villas (exciting layout on Nha Trang beach). Take mud bath at 100 Eggs Mud Bath. Golf at Vinpearl Golf Club (stunning island course off the coast of Nha Trang). Land transfer to Dalat stopping along the way at spectacular look-outs and local villages. Golf at Dalat Palace Golf Club (scenic and enjoyable course 5,000 feet above sea level dates back to the 1920s). Day 9 – Transfer to Saigon & Departure. Domestic flight to Saigon’s Tan Son Nhat International Airport for onward connection home.